Why are lawmakers so ready to forego huge tax revenues on gold but baulk at spending on food for the poor? 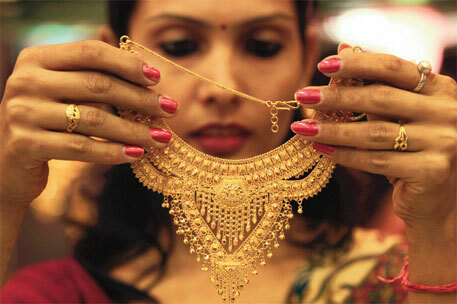 There is something obscene about India’s gold lust. It spans the entire spectrum of society. Almost everyone in the country, even those with limited or no means, want gold, either to flaunt or to hoard. One of the best examples of this weakness can be seen in Kerala where brides are walking jewellery stores, weighed down by heavy gold ornaments that exhibit not wealth so much as poor taste. The tendency of the Keralite to flaunt gold appears to have some link with the fact that most families have someone working in the Gulf, from where they bring in tonnes of the stuff, helped by liberal customs rules. But why single out the Malayali? Others are just as bad. How else would India remain the world’s largest gold importer, buying as much as 1,000 tonnes annually? Last year, in particular, was the season of gold fever in Parliament when MPs, cutting across party lines, coerced the then Finance Minister Pranab Mukherjee to withdraw the four per cent import duty he had proposed in the 2012-13 Budget. It was gold that brought about a rare show of unanimity in a fractious house usually riven by shouting matches and angry walkouts. Reporters covering the debate in Rajya Sabha had commented on this unusual amity in March 2012 when MPs pushed Mukherjee to retract his proposal. DMK MP Kanimozhi had an ingenious reason for demanding that the duty be scrapped: it would lead to smuggling of the yellow metal, she warned. The gold lobby in the country is strong, and effective. Along with the support of MPs, jewellers managed to get the duty rolled back after mounting a strike that lasted a couple of weeks. They didn’t want to pay the import duty or the minimal one per cent excise duty on unbranded jewellery. The result, as everyone knows, has been a deluge of imports that have bloated India’s current account deficit and led to a huge outflow of foreign exchange. The revenue foregone on gold and jewellery in 2011-12 was an unbelievable Rs.65,975 crore, dipping only marginally to Rs.61,035 crore in 2012-13. Budget documents show this segment been most favoured, accounting for 23 per cent of the duty exemptions or double that given to the machinery sector. A major rationale of subsidising the jewellery sector is to maintain the employment potential in this export-intensive sector. But it has failed dismally on this count. According to labour bureau statistics, the sector far from creating jobs has shed over 30,000 jobs. This leaves the government with not a fig leaf of an excuse for its largesse to this sector. How does this massive relief for gold imports compare with what the government intends to spend on the National Food Security Bill? The additional expenditure on food subsidies on account of the new law is just Rs.24,000 crore annually for the next three years. It begs the question why MPs do not see the irony of providing an indirect subsidy to the well-to-do when they are haggling over the much small outgo, less than half, on food subsidies to the very poor. Giving what is really sustenance-level supply of cereals— just 5 kg per head per month—is unlikely to make a dent on the monumental problems of deprivation and under-nutrition that Indians suffer from. India still ranks high on the Global Hunger Index (65th out of 79) and features among the countries listed as having an alarming hunger situation by the International Food Policy Research Institute which puts together this listing every year. If MPs could devote as much passion and time on issues that impact the poor as they do on endorsing the unconscionably huge write-offs to the more affluent sections, then perhaps India’s poverty and hunger levels would not be so shameful. Perhaps then they would not have to engage in competitive politics that prompts opposition parties to declare that they would introduce a better food security bill when they are in power. Food security, they seem to forget, is not a function of just keeping the public distribution system supplied with basic food grains. Or even with pulses. Food security is a complex sustainable development issue and calls for attention to a number of critical factors. Agriculture for one. The law that the UPA government managed to get through makes no mention of the farmer or the state of agriculture in the country. That is a big omission.